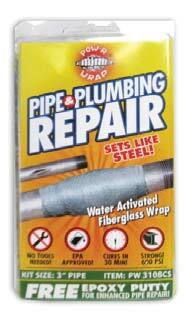 POW-R WRAP is a specially formulated water activated fiberglass tape designed as a strong, permanent and economical repair for water lines, irrigation lines, pipe lines, sewer lines, drainage lines or any other type of fluid or gaseous transporting lines. Permanent repairs can be made on almost any type of material and meets EPA requirements for Drinking water systems. 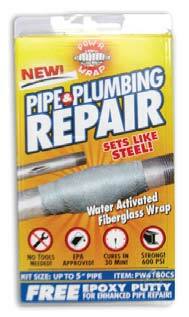 POW-R WRAP is a strong, permanent and economical repair. Works on virtually every kind of pipe. An easy alternative to traditional methods such as cementing, soldering, welding, sleeving and replacement. Works on wet, dry, clean, dirty or corroded pipes. Even Under Water!! POW-R WRAP is ideal for all fluid or gas bearing pipes and hoses and is recommended for structural repairs and strengthening, corrosion prevention as well as asbestos containment. The only limit is your imagination!